Vinyasa means to consciously place. In Vinyasa we work to link our movement to breath while being aware of where our body is in space. Vinyasa is a heat-building style of yoga which incorporates a gentle warm up, sun salutations, a number of standing sequences, a floor and/or seated sequences and a restful shavasana relaxation. Poses are usually held for between 3-5 breaths. 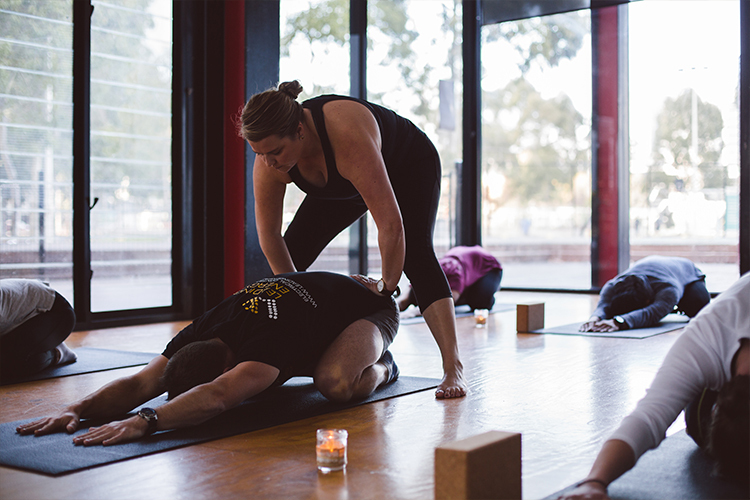 Roar Spirit's vinyasa classes are geared to all levels including beginners. Restorative yoga is a gentle style of yoga where the body is given the opportunity to fully relax and be supported by a number of props including bolsters, blankets and blocks. There is very little to no muscle activation in restorative yoga - giving you the opportunity to completely surrender to relaxation. Conducted in a studio heated to 37 degrees, yoga asanas (postures) are taught in a slow, mindful and deliberate manner, designed to build strength and create openness in both body and mind. For more information on Lydia's Hot Yoga classes visit the Yoga Corner website. Yin is an active long-hold-style of yoga which works on targeting specific areas within the body including bones and where they intercept (joints) and your body’s connective tissues. You will spend a few minutes in each pose, focusing on breath, so you can really notice how your body is responding. The poses are mostly floor-based so that you can best utilise gravity and your body weight to encourage an opening or shift in these tissues and joints.